Spirits of Vengeance #1 Review! Marvel’s relaunch of Spirits of Vengeance is one of a handful of new series launches within Marvel Legacy. The premise, as executed by the creative team of Victor Gischler and David Baldeon, essentially builds their own version of Justice League Dark starring Son of Satan, Ghost Rider, Blade and eventually Satana. It’s not an awful idea, but it’s an oddly transparent bit of 90’s comics nostalgia for a number of characters that really haven’t stuck a landing in decades. Ghost Rider’s the most stable of the bunch, but is the ol’ flaming skull enough of a hook to carry a team? Unlike the continued ongoings of Marvel Legacy, Spirits of Vengeance doesn’t have to support the weight of series baggage, and instead starts fresh. Unfortunately it does so in sluggish, uninteresting fashion. Johnny Blaze teams up with Daimon Hellstrom (aka Son of Satan) to hunt down a mysterious evil presence. The end result is Hellblazer-lite, and a disappointingly tired approach to Marvel Comics. Looking back at a closely related series like All-New Ghost Rider , you can see creators trying new visual and storytelling approaches to Marvel’s more demonic elements. Nothing about Spirits of Vengeance awakens any of these hellish sensations. It’s admittedly unreasonable to reduce an ongoing series to its first issue, but in this apparent war between angels and demons, the true miracle will be Spirits of Vengeance lasting beyond twelve issues. 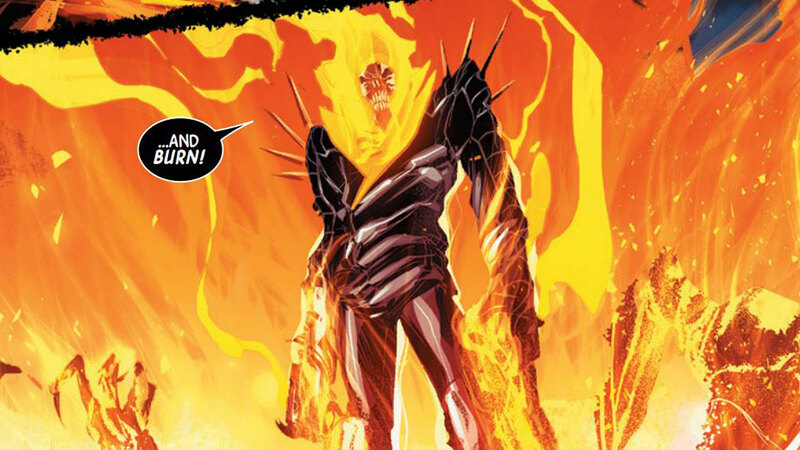 One of the few bright spots in Spirits of Vengeance stems from a line that Johnny Blaze’s Ghost Rider is responsible for “The universe’s greatest betrayal.” Given what we know about Ghost Rider’s prominent role in Marvel Legacy #1, there’s a chance this is a direct connection to the rot at the core of the Marvel U. Time will tell how directly Spirts of Vengeance connects to the major narrative, but this could actually help the series get its feet off the ground. A quick rundown reading to familiarize yourself with the cast of Spirits of Vengeance, and what they have been up to heading into this new series. I know nothing about the characters but I actually enjoyed the first issue. Spirits of vengeance is a five issue miniseries. Well at least my fool’s prediction is looking like a lock!